The bank reported second quarter results Thursday, growing its equities business 37% to $US807 million. 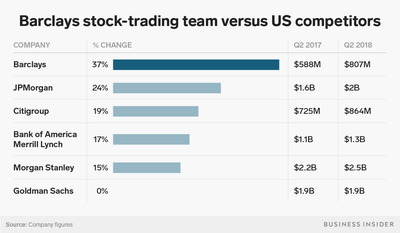 Barclays’ gains easily outpaced those of European competitors Credit Suisse, Deutsche Bank, and UBS. And while its equities business is still much smaller than those of its US peers in terms of revenue, it grew more than any of them and is within shouting distance of Citigroup, which posted $US864 million in second quarter revenues. 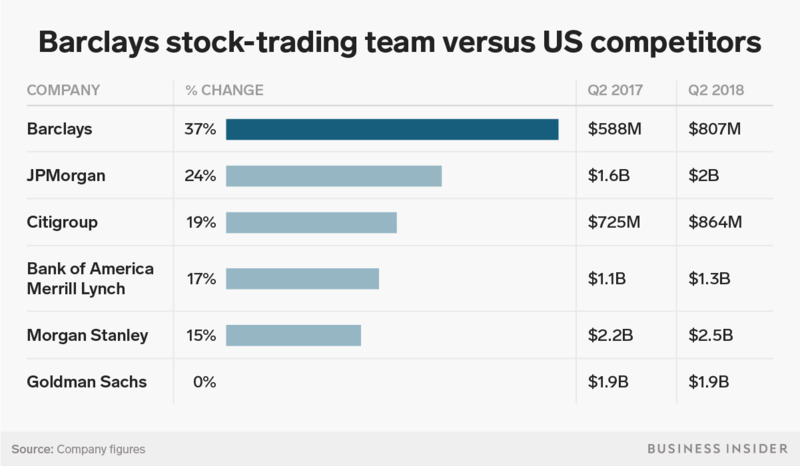 It’s the second straight quarter of rapid growth for the bank’s stock-trading team, which grew 43% to $US827 million in the first quarter – the most of any bank during that period as well. The division has struggled in recent years and in 2016 said it would exit its Asian cash equities business. But lately under CEO Jes Staley it has focused on bringing on new talent and investing in technology, which has helped boost its electronic trading volumes. In September 2017,Barclays brought in Stephen Dainton, formerly of Credit Suisse, as global equities chief, and Dainton has been on a hiring spree since.